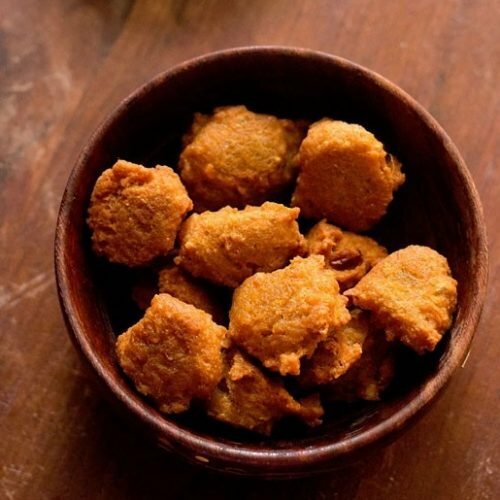 chana dal pakoda recipe - crisp and soft pakoras or fritters made with ground bengal gram. pick and then rinse the dal for a couple of times in water. soak the chana dal in enough water for 3 to 4 hours or overnight. drain the soaked dal and add them to the grinder. add 1.5 to 2 tbsp chopped onion along with the chopped green chilies, ginger and garlic, asafoetida, fennel seeds, cumin seeds in the grinder. add 1.5 to 2 tbsp water and grind to a smooth batter. take the ground batter in a bowl. add 2 tbsp chopped onion and salt. also add a pinch of baking soda if using. mix the batter very well. heat oil for deep frying in a pan or kadai. drop spoonfuls of the batter in medium hot oil. fry the chana dal pakoras till crisp and golden. serve chana dal pakoras hot or warm with green chutney or coconut chutney or tomato ketchup.